As China's first domestic sci-fi blockbuster The Wandering Earth impresses moviegoers around the world, Hugo Award winner Liu Cixin and renowned Canadian filmmaker James Cameron predict a brighter future for China's sci-fi film industry. Liu, China's leading sci-fi writer and executive producer of The Wandering Earth, says that the movie, which premiered during this year's Spring Festival, had achieved "great success" at the domestic box office, marking "a good start for China's homemade sci-fi movies". Based on Liu's novella of the same name, The Wandering Earth presents the story of an epic project to move the Earth and its 3.5 billion residents to a remote star system because the sun is dying and about to swallow the Earth. It has raked in more than 4.4 billion yuan (about $659 million) in China as of Thursday, the second-highest takings in China's box-office history, according to Maoyan, a professional box-office tracker. The movie also broke a five-year box-office record for Chinese films in the North American market, the movie's official account on Sina Weibo, the Chinese equivalent of Twitter, said recently. "Science fiction is really taking the central stage in China. Let's just see more of it," says James Cameron, the Oscar-winning director of sci-fi classics such as Avatar, Aliens, and The Terminator. Cameron, who was in China to promote his new film Alita: Battle Angel, which hit Chinese theaters on Feb 22, attributes the success of China's latest sci-fi blockbuster to the country's growing visual effects industry. "The state-of-the-art visual effects (industry) in China has been evolving over time, and is now mature enough to compete globally. That makes Chinese cinema ready to accomplish anything that can be imagined," he says. All the props and scenes in The Wandering Earth were made and built by Chinese crew members, and 75 percent of the special effects were produced by Chinese companies, according to Guo Fan, the director of the movie. Cameron adds that the growing popularity of sci-fi movies in China is also because technology is contributing significantly to the "economic might" of the country. And his views are echoed by Liu who says China's domestically-produced sci-fi movies are emerging amid "a strong sense of future in the rapidly modernizing country". Public enthusiasm for sci-fi has been ignited in China as the country is witnessing a technological boom, and over the past few years has launched a spate of ambitious space programs, including plans for its own space station to be operational by 2022. "Maybe it's just the right film at the right time. It captured a wave," Cameron says. "Hopefully that wave will create the next wave, and hopefully it's just the start of a movement." 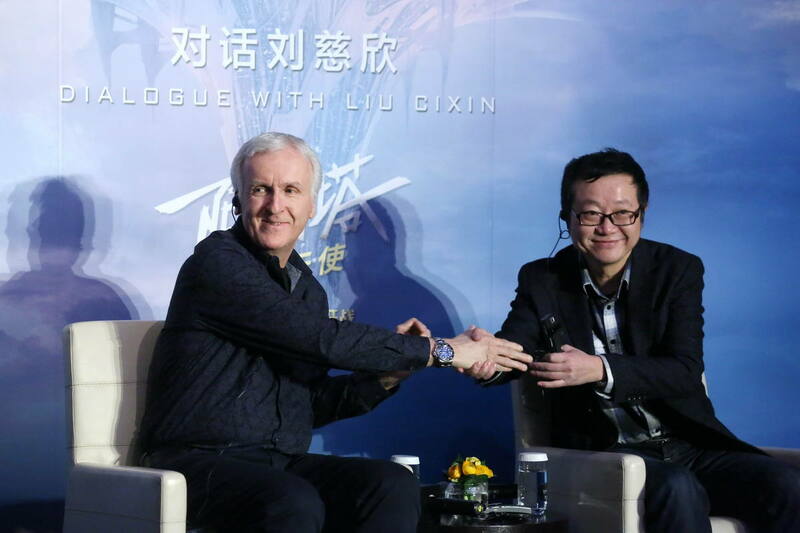 Calling himself "an enormous fan" of Liu's works, Cameron also says he wants to see Liu's award-winning trilogy, The Three-Body Problem, adapted for the big screen. The three-part saga, much greater in scale than The Wandering Earth, portrays centuries-long clashes between earthlings and aliens. However, Liu says that despite the notable progress made by China's film industry in its production processes in recent years, the adaptation of the trilogy might still be too difficult for China's sci-fi filmmakers. "China's sci-fi movie industry still lacks a mature industrial system, when compared with its American counterpart," he says, adding that the country also needs good sci-fi authors and screenwriters as well as high-quality original sci-fi works. "We are off to a good start, but we still have a long way to go," he says. As China's 1st domestic sci-fi blockbuster "The Wandering Earth" impresses moviegoers, Hugo Award winner Liu Cixin and renowned filmmaker James Cameron predict a brighter future for China's sci-fi film industry.